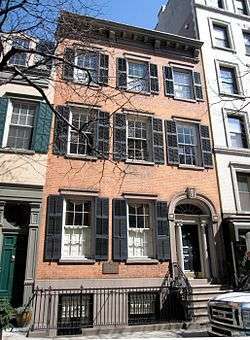 203 Prince Street is an historic townhouse on Prince Street between MacDougal and Sullivan Streets in the SoHo neighborhood of Manhattan, New York. Built in 1834 with 2 1/2 stories on land that was once part of the estate of Aaron Burr, the house acquired an additional full story in 1888. Primarily constructed in the late Federal style, the building also has elements of the Greek Revival style. The house was designated a New York City landmark in 1979, and was added to the National Register of Historic Places in 1983. 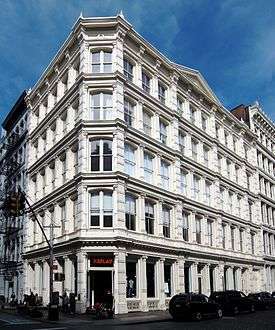 109 Prince Street at the corner of Greene Street – where it is #119 – in the SoHo neighborhood of Manhattan, New York City is a historic cast-iron building. It was built in 1882-83 and was designed by Jarvis Morgan Slade in the French Renaissance style. The cast-iron facade was provided by the architectural iron works firm of Cheney & Hewlett. The building, originally a store, has been described as one of the most striking gems of the 19th century cast iron architecture in the world. Completely restored in 1993 by architecture firm Kapell & Kostow, it was awarded the prestigious Landmark Certificate of Merit by the New York City Landmarks Preservation Commission in 1994. 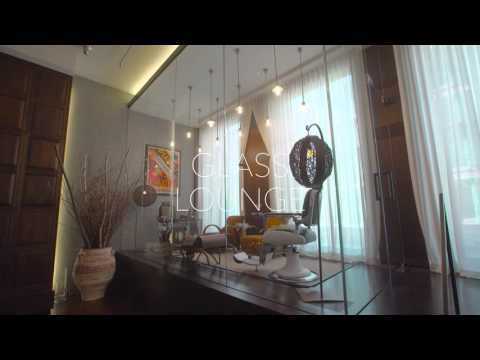 It is located within the SoHo - Cast Iron Historic District. 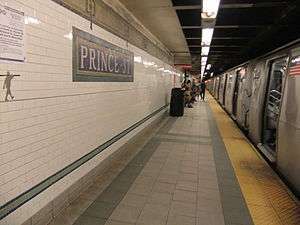 Prince Street is a local station on the BMT Broadway Line of the New York City Subway. It is served by the N train at all times, the R train at all times except late nights, and Q train during late nights. Each side platform contains a fare control area and there are no other exits nor any crossovers or crossunders to allow free transfers between opposite directions. Prince Street opened on September 4, 1917 as part of the first section of the BMT Broadway Line from Canal Street to 14th Street – Union Square. In the late 1960s, New York City Transit extended the platforms for 10 car trains, and fixed the station's structure and the overall appearance. They replaced the original wall tiles, signs, and incandescent lighting with a 1970s style wall tile band and tablet mosaics, signs and fluorescent lights. It also fixed staircases and platform edges. In 2001, the station received a major overhaul. It included an upgrade of the station for ADA compliance and restoration of the original late 1910s tiling. New York City Transit repaired the staircases, re-tiled the walls, fitted new tiling on the floors, upgraded the station's lights and the public address system, installing ADA yellow safety threads along the platform edge, new signs, and new trackbeds in both directions.